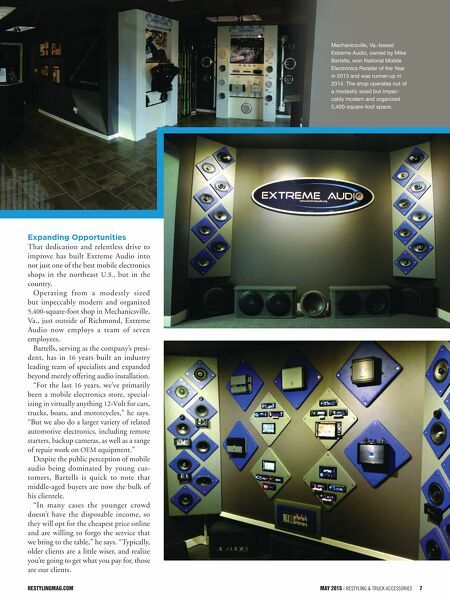 restylingmag.com May 2015 | Restyling & tRuck AccessoRies 7 Expanding Opportunities That dedication and relentless drive to improve has built Extreme Audio into not just one of the best mobile electronics shops in the northeast U.S., but in the country. Operating from a modestly sized but impeccably modern and organized 5,400-square-foot shop in Mechanicsville, Va., just outside of Richmond, Extreme Audio now employs a team of seven employees. Bartells, serving as the company's presi- dent, has in 16 years built an industry leading team of specialists and expanded beyond merely offering audio installation. "For the last 16 years, we've primarily been a mobile electronics store, special- izing in virtually anything 12-Volt for cars, trucks, boats, and motorcycles," he says. "But we also do a larger variety of related automotive electronics, including remote starters, backup cameras, as well as a range of repair work on OEM equipment." Despite the public perception of mobile audio being dominated by young cus- tomers, Bartells is quick to note that middle-aged buyers are now the bulk of his clientele. "In many cases the younger crowd doesn't have the disposable income, so they will opt for the cheapest price online and are willing to forgo the service that we bring to the table," he says. "Typically, older clients are a little wiser, and realize you're going to get what you pay for, those are our clients. 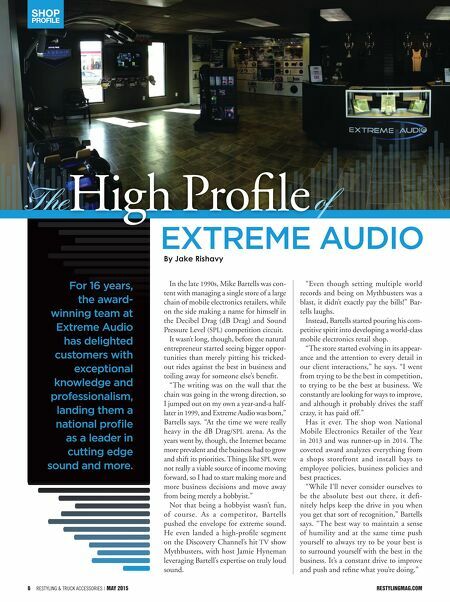 Mechanicsville, Va.-based Extreme Audio, owned by Mike Bartells, won National Mobile Electronics Retailer of the Year in 2013 and was runner-up in 2014. The shop operates out of a modestly sized but impec- cably modern and organized 5,400-square-foot space.